Catering for large crowds can be a daunting task. You need to work out additional quantities and your workload is vastly increased. In fact, some people find it so challenging that they would rather hire a caterer than do it themselves. But although catering for large crowds is hard work, it is definitely rewarding. Furthermore, it’s really satisfying to see people enjoying the food that you’ve helped to prepare. So if you’re tasked with providing the food for a large crowd don’t worry, we’ve put together a list of tips. 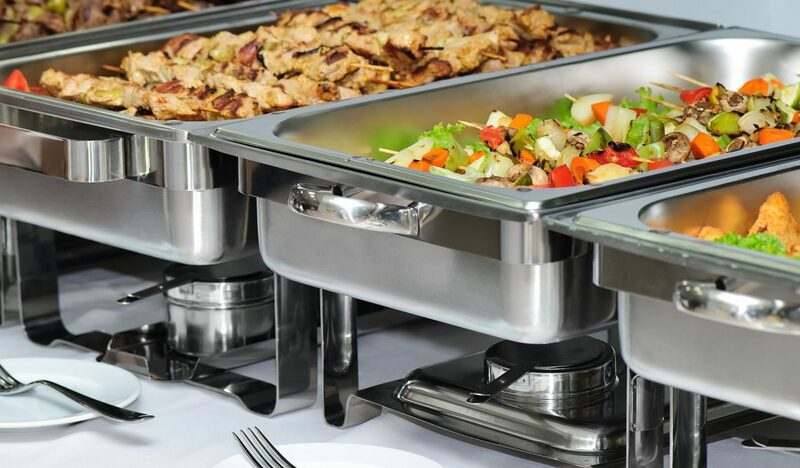 You might think the easiest way to feed your guests is to lay on a buffet-style spread but it isn’t for large crowds. A larger group of guests leads to queues building up and food going cold. It will be much harder to keep an eye on the temperatures of the hot food and this is really important when it comes to food safety. It is far better to have a mix of servers who can dish up the hot food or the expensive proteins like meat or fish. Then you can have tables where guests can help themselves to bread and salads. It is very difficult to cook and keep a lot of food hot for an event. Even if you have some way of keeping it warm, if it stays warm for too long it will dry out eventually. The best way is to have a few mains that are hot and then serve these alongside cold side dishes. For example, hot rotisserie chicken or marinated steak with salad and bread rolls. Don’t serve seafood when catering for large crowds, you don’t want it hanging around in the warm. You don’t have to make everything from scratch. You can use shop-bought produce, such as dips and bread for starters and appetizers. If you are pushed for time why not use pre-cut vegetables and frozen herbs to save time and energy? You can add to pre-prepared antipasti platters and cheese boards with artisan crisps, crackers and grapes. Use shop-bought produce to fill in a few gaps will save time and effort. Catering for large crowds costs money. However, catering experts say that guests always serve themselves to the same number of slices whether the slices are thick or thin. So it makes sense to slice the most expensive part of the meal thinly to keep costs down. You can then get the maximum number of slices and feed the most guests by adopting this method. Protein is the most expensive food item on your shopping list. Offer two to three protein options but supplement these with many different vegetable and salad options. Remember, they can be hot or cold. It is far better to have too much food than to run out. Left-overs can be frozen and eaten for the next few days. You can give away any expensive meats to friends and family members to take home. And the same goes for wine and spirits. Snacks are a great way to keep guests happy while you get the main event ready. It also fills them up a little and stops them from getting grumpy because they haven’t had anything to eat. So even if you are putting on a fabulous spread, don’t forget to place bowls of nibbles here and there. You are undoubtedly going to have your hands full with the catering, so the last thing you need is to serve people their drinks. Instead, why not make huge pitchers of drinks and label them? You can then surround them with glasses and allow guests to help themselves. Or why not have coolers full of ice and beers ready for your guests? Finally, don’t forget to ask all your guests if anyone coming to the event has any dietary restrictions. If they have, ask if it is better if they bring their own food or if they are happy for you to cater for them. If you are catering for them, be absolutely sure you are aware of the restriction and when cooking, do not allow their food to come into contact with their restricted food.